This is an exception to the norm for The Arch, but I can’t resist – I think it’s a truly native use of SL, and well worth a visit. If Googie Architecture, sci-fi, horror and/or good-bad old school cinema is your thing, Sky Cinema fly-in theater will be your favorite build of all time. I recently met Larry Rosenthal (avatar Cube Inada), founder of Cube 3 over a slice of pizza in real life through an introduction by Chip Poutine, and found his enthusiasm and profound knowledge of the past, present and future of virtual worlds to be intense and quite fascinating. I would expect nothing less than the incredibly thorough and fun-loving manifestation that is C3 Sky Cinema Fly-In from Cube, and I wish him great success. Visit the Barsoom sim (SLurl), check out the Adventurer’s Society of SL (co sponsor of the cinema) Group, as well as Starbase C3. They’ll be having scifi triva contests every Thursday night at 5pm SL-time at the C3 Skybar Lounge in Sawrey. 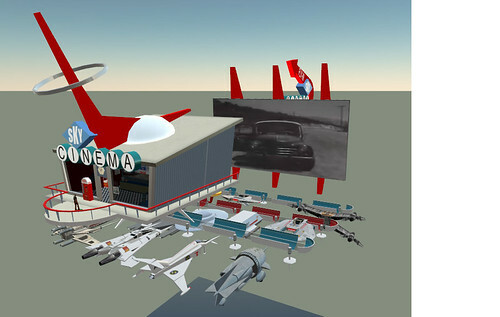 Also, don’t miss the Second Life Insider’s story about C3 Sky Cinema Fly-In. Check out a slideshow of Sky HERE.